I'm just about to set off on a week of travelling to meet asbestos consultancies using Alpha Tracker or thinking of using Alpha Tracker to discuss their needs and how the system can help their environmental businesses. We've been incredibly fortunate during 2017 with a huge growth in asbestos companies using our software (either moving from paper-based systems or from alternative software providers) and the new ideas these clients are bringing to us are really exciting. 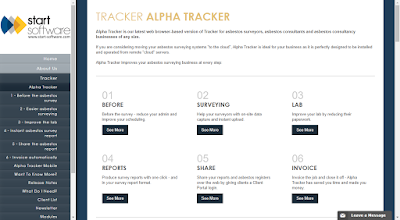 If you have an idea to help us to make Alpha Tracker even better, please do get in touch. We'd love to hear from you.